WASHINGTON – The day after the devastating earthquake struck Haiti, President Barack Obama extended the “deep condolences and unwavering support” of the American people to Haiti and pledged “full support” for rescue and humanitarian assistance. In the days since the Jan. 12 quake, U.S. and international troops and humanitarian agencies have ramped up deliveries of food, water, medicine and heavy equipment to help the quake’s survivors. 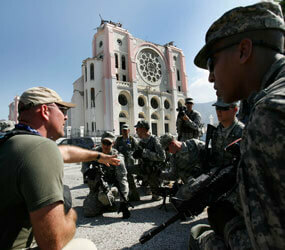 More than 12,000 U.S. troops were on the ground in Haiti and aboard 20 ships offshore delivering aid. The distance between Miami and Port-au-Prince, the Haitian capital, is only 700 miles, but the U.S. and Haiti have not had a relationship as close. Although Haiti was founded in 1804 – following a slave revolt against French rule – the U.S. did not recognize the new country until 1862 when it extended formal diplomatic recognition. In the years after the Civil War, U.S. attention to Haiti focused on trade. Things changed in 1915 when Haiti was in the middle of political unrest and the country’s president was assassinated. President Woodrow Wilson sent U.S. Marines into Haiti to restore order and protect American interests as part of an occupation that lasted until 1934 when President Franklin D. Roosevelt initiated a “good neighbor policy” toward Haiti and all of Latin America. The aim was to replace an attitude of interventionism with an effort to strengthen diplomatic and commercial relations with those countries. After U.S. forces left Haiti, the country regained sovereign rule and came under the dictatorship of Francois “Papa Doc” Duvalier from 1956-71. After Duvalier’s death, his son, Jean-Claude, continued the dictatorial regime. During this time, Haiti maintained a good relationship with the U.S. but it deteriorated in the 1980s when U.S. government and church leaders challenged human rights abuses in Haiti and criticized the Haitian government for failing to stop the flow of narcotics into the U.S.
Salesian Father Jean-Bertrand Aristide, voted Haiti’s first democratically elected president in 1991, was ousted later that year by a military coup. He was president again from 1994 to 1996 and from 2001 to 2004 before being ousted again in 2004 – an action which he claims was supported by the U.S. government. The priest, who was expelled from his order for his political involvement, laicized by the Vatican in the 1990s and later married, is currently in exile. In the early 1990s, thousands of Haitian “boat people,” fleeing violence and poverty in small boats and rafts, tried to reach the United States. Lacking legal status, they were predominantly turned away. In 1992, Boston’s Cardinal Bernard F. Law, then chairman of the U.S. bishops’ Committee on Migration, wrote a letter to President George H.W. Bush, comparing the turning away of Haitian boat people to refusing entry to Jews at the time of the Holocaust. “The sad memory of Jews being refused entry before World War II should teach us that never again should we turn our back on a human being pleading for our help and hospitality,” wrote Cardinal Law. In 1993, the head of the U.S. bishops’ international policy committee reiterated support for a return to democratic government in Haiti and cautioned against outsiders seeking to impose a desired outcome. “At this particularly difficult moment for the people of Haiti, we wish to repeat our expression of support and solidarity, and our prayerful hope that, aided by the constancy of the international community in providing needed help, the Haitian people will be enabled to arrive at a just, equitable and truly Haitian solution,” he said. Haiti has been plagued for decades by an extremely high unemployment rate. According to the State Department, the U.S. has been Haiti’s largest donor since 1973. From 1995-2003 the U.S. contributed more than $850 million in assistance to Haiti, and since 2004 has provided more than $600 million for economic recovery and critical human needs. After the Jan. 12 earthquake the United States responded with more than just money after the earthquake, sending in troops and supplies, and was urged to take even more action by the U.S. bishops. Three days after the earthquake, U.S. Homeland Security Secretary Janet Napolitano said Haitians currently living in the United States without legal status would be granted temporary protected status, allowing them to remain in the country and legally hold jobs while their country recovers. In the hours before Napolitano made her announcement, religious, political and human rights leaders had urged the administration to immediately grant the designation, which has long been sought because of Haiti’s precarious conditions.